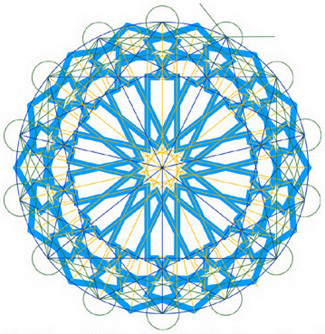 Paul offers a five class series for both kids and adults in the principles of Islamic geometric design. 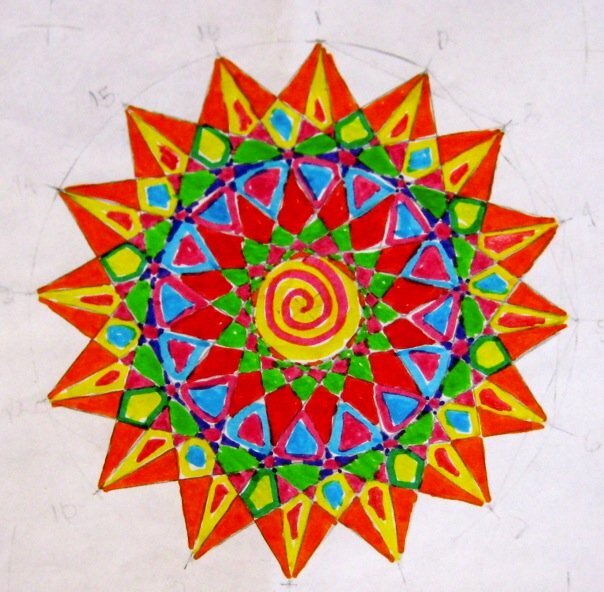 Using nothing but a compass and a straight edge, participants will learn to make their own mandalas and tessellations (interlocking tile patterns). The techniques taught are simple and readily learned, regardless of "artistic skill" or previous experience. After completing the series, students will be able to create their own original patterns. Launch your personal journey of discovery within the circle and explore the infinite variations possible. Studio Classes are limited to five students and are held at Paul's home. Paul offers 3,4 and 5 day workshops for middle through high school students. A slide show and lecture on Islamic culture and history is included in the program and meets district requirements for social studies units on world religions. Slides and stories from many of Paul's voyages around the world are featured. If you are a teacher and are interested in bringing Paul's program to your school, E-mail him for information on pricing and grants. Paul's workshops are funded in Boulder through your taxpayer dollars, courtesy of YOAB and the BAC. Level one classes cover the divisions of the circle into 4,6,8,12 and 16 parts and provide an introduction to both tessellation and creating patterns in interlace. Level two gives students the opportunity to recreate two of Paul's complex designs from scratch and will teach advanced interlace. Divisions of the circle into 5, 7 and 9 will also be studied. Classes run for five consecutive weeks at a cost of $105 for the series. They are scheduled based on the number of interested students. E-mail Paul if you would like to take a Level II course. The course is only open to those who have taken either Level I or had the program at their school. Pre-registration is required. "I thought it looked too hard, but he taught me how to make my own mandala designs!" -Rhiana B. "I would suggest this class to every art teacher. This activity exposed me to a very little known art"	-Nathan C.
"It was valuable to see pictures instead of just hearing information, and Paul made learning about another culture fun!" -Caitlin F.
"We learned how to draw objects that aren't common in our culture, and we learned a lot about Islamic people." I learned a new technique that I knew nothing about." -Gordon P.
To register for a class, e-mail me at shimari@comcast.net.